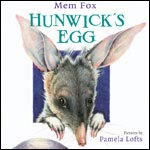 One day, Hunwick the bilby finds an egg. He takes it back to his nest and cares for it. He tells his dreams to it and confides in it, but the egg never replies. Hunwick's neighbours worry about him, but Hunwick has his relationship with the egg all sorted out. This book is not typical of Mem Fox's picture books. Although there is the same lyrical quality to the text we've come to expect, the structure of the story is unusual. I enjoyed it, and think it would appeal to children who like their books a little quirky, a little off-beat. Pamela Lofts's illustrations are breathtaking. The colour and detail bring Australian native plants and animals to life. Even though I loved the wonderful picture of a thorny devil on the first page, I asked myself why it was included as there had been no such character in the story. That certainly didn't spoil my appreciation, though. Hunwick's Egg (Harcourt 2005) would make a great Easter gift for a child. It could spark a discussion about unusual friendships, or provide a rich resource for children studying Australia.